At the end of Situation Out of Control, I had a few questions, for which I needed answers. Hence my decision to pick up Full Exposure. Did I receive the answers I was looking for? Mostly it did, and it helped me to understand the hero's actions. I went into this story disliking the hero, Cole Danes and to be honest I never thought my feelings would change. He came off has a callous and cold-hearted individual. However, I soon came to learn there was more to his story and by the end of the book, I found myself liking him and hoping he would get the closure he needed to move on. Angel Parker, a single mom and nurse found herself in a sticky position when she was forced to leak classified information from the Colby Agency to a ruthless mercenary who was determined to destroy Cole. At first, I didn't know what to think of Ivy, but I slowly learnt that she was protective of those she loved, which placed her in a vulnerable position. I found her courage in the face of danger amidst her fears admirable. Cole's investigation led into the information leak led him to Angel's doorsteps. He then uses Angel as leverage to capture the mercenary. What followed was a game of cat and mouse. I thought the suspense thread was well done, but the romance was non-existent. Under, the circumstances there would not have been anytime for them to have any romantic moments. However, the danger did not prevent passion from glaring between them. This is where things got interesting, as romance was not on either of their agendas. This installment ended on a good note as all the issues that led up to events in this book were adequately dealt with and there were no unanswered questions. 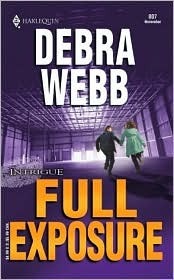 Overall, Full Exposure was an ok read. Not as exciting as I hoped, but I still I had a good time. Specialist Cole Danes's investigation revealed the unthinkable: a trusted, longtime personal assistant toVictoria Colby had been the source leaking highly sensitive information that could have resulted in the agency's destruction. But it soon became clear that a secondary party was the real culprit. Single mom Angel Parker was being manipulated and controlled by a sinister mercenary driven to destroy the Colby Agency using any means necessary. Only, that was about to stop...dead! Cole was determined to complete his mission, and he needed Angel to accomplish that end. But he didn't expect to need Angel.... He had every intention of being as ruthless as his adversaries and using Angel as his pawn, but spending time in seclusion with her wore away his emotional armor. Now he was more concerned with protection than retribution, which could prove fatal for them both.